Zao Onsen is a traditional onsen hot spring village nestled high up above Yamagata City, about 16km to the south east of the city centre. 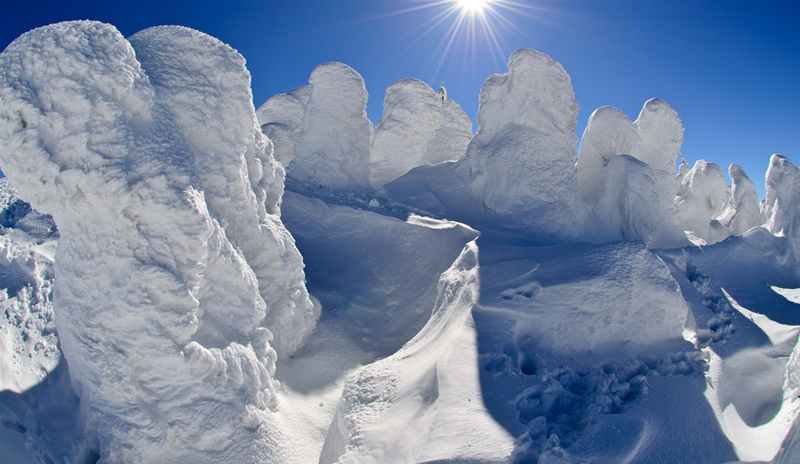 Zao Onsen is also the name of the large scale ski and snowboard resort famous for it's Juhyo ('Ice Monsters'). Many of the base ski lifts are within walking distance from the main village. Juhyo can be found on a limited number of mountains in Japan. This beautiful natural phenomenon makes for spectacular scenery and is one of the reasons why many people visit Zao Onseneach season. From the north Tokyo and Kanto region, take the Tohoku Expressway north until the Murata JCT. At Murata JCT, turn left onto the Yamagata Expressway and head westwards for about 36km towards Yamagata City. Exit the Yamagata Expressway at the Yamagata Zao IC. On exiting the toll gates take Route 286 and then soon turn into Prefecture Road 67. After about 10km take the Nishi Zao Kogen toll road (normal charge 310 yen) and continue on the road until reaching Prefecture Road 21. Turn left to head into the main Zao Onsen village area. Zao Onsen is less than 20km from the Yamagata Zao IC exit and is well signposted along the way. Approaching from the south west of Yamagata city on Route 13, turn right onto Prefecture Road 12 towards the Zao Echo Line and after around 1km turn left onto Prefecture Road 14. Follow this road into Zao Onsen village. Zao Onsen village and the resort is about 12km from the Route 13 turn off. Both are actually located in Kaminoyama City. To get to those resorts from central Zao Onsen village area head south on Prefecture Road 53. For Zao Liza World, continue on Prefecture Road 12 (also known as the Echo Line). 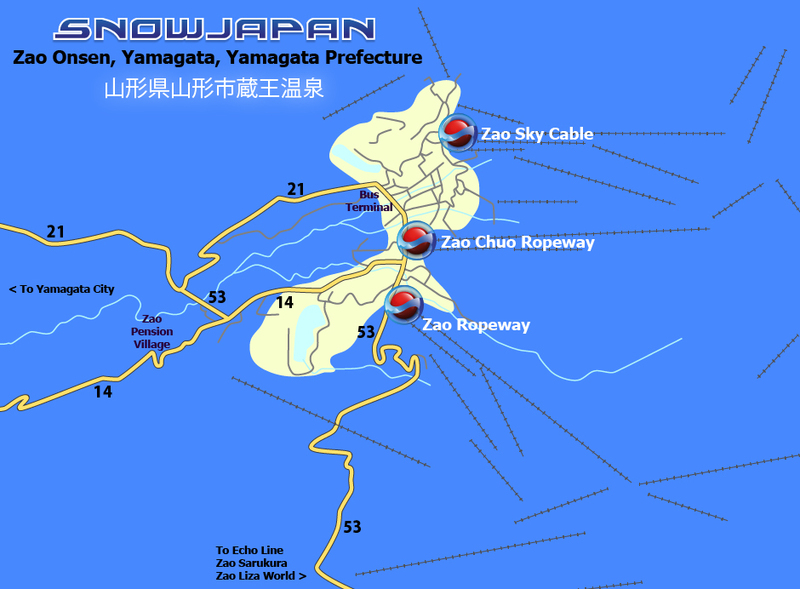 During the summer months the Echo Line road is open connecting Zao Onsen in Yamagata Prefecture with Zao Town in Miyagi Prefecture. This road is closed during the winter months due to heavy snowfall. For detailed information on how to get to Zao Onsen by train and public transport, please go to this section.